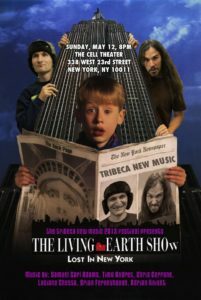 I want to issue my highest recom­men­da­tion for the Living Earth Show’s May 12th concert at the Cell Theater. Travis Andrews and Andy Meyerson (electric guitarist and percus­sion­ist, respec­tively) have commis­sioned a remark­able body of work for them­selves over the past few years, and they throw them­selves into playing it with a gusto that is inspir­ing to behold. And you needn’t take my word for it; their YouTube page features many compellingly-performed/pro­duced music videos of their commis­sions. In this video, the duo performs Sam Adams’s Tension Study no. 2, with the fetching trapeze artist Deanna Hammond swinging overhead. Aw, thanks brah. FYI, for all you Timo-fans reading this, we’ll be playing some Timo-music on this show too: the wonder­ful You broke it, you bought it, which is the closest thing to Mozart we’ll ever play.